Showers this evening becoming less numerous overnight. Thunder possible. Low 47F. Winds NNW at 15 to 25 mph. Chance of rain 40%..
Showers this evening becoming less numerous overnight. Thunder possible. Low 47F. Winds NNW at 15 to 25 mph. Chance of rain 40%. 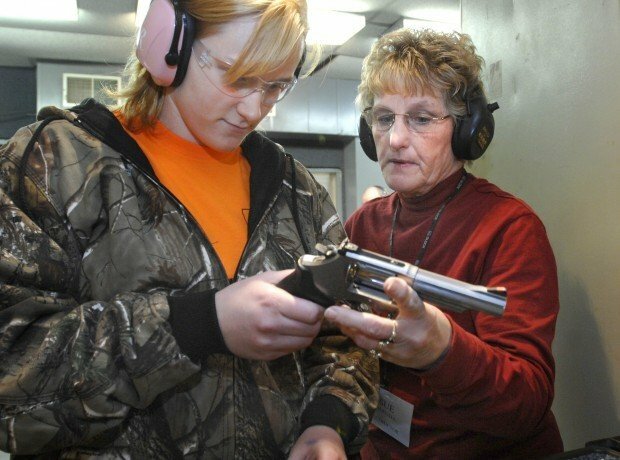 Before students in Sue Darnall’s gun safety class learn how to load and fire a weapon they are given advice that could affect their decision to pull the trigger in a stressful situation. “You have to answer the question: do I have it in me to take someone else’s life? We don’t know. We can train for that possibility but we never know until we have the experience. Firearms should always be considered a tool of last resort,” Darnall told a group attending a recent personal protection class at the shooting range and training center she and her husband, Ron, own west of Bloomington. For the seven students in the class, a passing grade meant they could apply for a permit from Florida for something available in every state except Illinois: the right to carry a concealed weapon. The Florida permit is recognized in 32 other states. In Illinois, the Family and Personal Protection Act that would allow gun owners to carry loaded firearms — either openly or concealed — in a vehicle and into certain public places came up six votes shy in the Illinois House last year. Anti-gun lawmakers from the Chicago area provided most of the opposition. But the debate is not over: State Rep. Brandon Phelps, D-Harrisburg, expects to bring the bill back for another vote this year. “When I start something I fight for it. Right now we’re at the mercy of criminals,” said Phelps, acknowledging he needs support from Cook County for the bill to pass. Under the proposal, applications would be handled by county sheriff’s departments — a process that should make the public feel more confident, said McLean County Sheriff Mike Emery, an avid supporter of concealed carry. Sheriff’s departments, he said, “have a lot of direct contact with citizens of the community. In McLean County, we have access to court-related documents through the EJustice System that allows us to do local background checks which would assist in verifying a person’s qualifications,” said Emery, referring to the county’s criminal justice data program. Applications would be sent to the Illinois State Police with a recommendation for issuing or denying a permit. Permit holders also would be required to pay a $100 fee and complete eight hours of gun safety and firing range training. Normal Police Chief Rick Bleichner is waiting for a final version of the law, but he favors local screening of applicants. “We have a good working relationship with the sheriff’s department, so I know we could get answers quicker if there was an issue,” said Bleichner. Among exclusions in the bill are state and local government buildings, courthouses and stadiums. Business owners, schools and universities must consent to permit holders bringing firearms into their buildings. Bars where less than half the revenue comes food sales would be off limits for guns. Each side in the intense debate has its own interpretation of what the framers of the Constitution meant when they penned the Second Amendment. The right of citizens “to keep and bear arms” is the bedrock upon which concealed carry support has been built across the country. “It’s a constitutional guarantee. I think people should have the right to protect themselves because law enforcement is not equipped to totally protect them. The only people carrying guns now are cops and crooks,” said Madison County Sheriff Robert Hertz, president of Illinois Sheriff’s Association that in 2009 dropped its neutral position and approved a resolution endorsing concealed carry. But hinging support on the Second Amendment for a law that could put police officers and citizens in dangerous situations does not make sense to Laurie Bergner, vice president of programs for the McLean County League of Women Voters. “Nowhere in the Second Amendment does it refer to concealed guns. Having a right doesn’t mean it’s the right thing to do,” said Bergner, who argues the founding fathers did not intend for citizens to be uniformly armed. Bloomington Police Chief Randy McKinley is concerned gun owners may not grasp the heavy moral and legal responsibilities of carrying a gun in public. 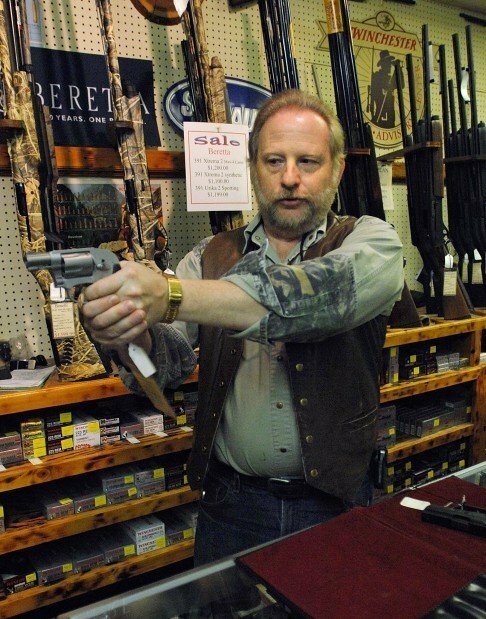 “My struggle with concealed carry is that while I’m 100 percent behind the constitution and the right to bear arms, I don’t think people understand the responsibility of that,” said McKinley, who described his level of support as 49 to 51 percent against the concept. He admitted the 1986 death of Bloomington police officer Billy Osborn, who was killed after a prisoner grabbed his weapon, has influenced his stance on the issue. “If you pull a gun in public, be ready to defend that decision or have it taken away and used against you,” the chief cautioned. The state must ensure only qualified people get permits, said Mark Walsh, campaign director with the Illinois Council Against Handgun Violence. “We have to make sure prohibited purchasers are excluded. Balancing the rights of the individual with the rights of the larger group of society has to be addressed,” said Walsh, adding updates to the Illinois State Police FOID system are crucial in keeping the mentally ill from obtaining permits. An estimated 280 million firearms are legally owned in the U.S. and an untold number of others are held illegally. A 2010 poll on gun issues conducted by the Pew Research Center shows Americans are evenly split on whether it’s more important to protect gun rights or control gun ownership. Men were stronger supporters of gun rights — 55 percent versus 38 percent for women. But the percentages reversed on the issue of controlling ownership with 53 percent of women favoring control versus 39 percent of men. Data compiled by the Violence Policy Center starting in 2007 puts the number of people killed by citizens legally allowed to carry handguns at 385. McLean County Diversity Project member Chad Roberts worked with Pantagraph reporter Edith Brady-Lunny on today’s stories about concealed carry permits of firearms in Illinois. The Tri-Valley High School senior provided research assistance and accompanied Brady-Lunny to an interview at Smiley’s Gun Shop in Bloomington. “I just naturally seek out knowledge, and I think it is important to know how to find good information, so you can have valid opinions and make informed decisions,” said Roberts, who is in his seventh year with the Diversity Project. He plans to pursue a degree in engineering after high school. Personal bias is something journalists are trained to avoid when they cover the news. When I started working on a story about the controversial issue of concealed carry of weapons in Illinois, I was forced to face my own bias.